Heather’s note: This is an excerpt from a letter Dad wrote his 4 kids on July 21, 2009. I’m posting it in three parts. For me, this is a summer of remembering, of being remembered and reminded. Three adventures have been brought to my mind, three worthwhile causes to which I have contributed. Not that the original intention was mine in any of the three cases, but I responded, and gave leadership and continuity at least in the early stages. It has been gratifying to remember and be reminded. I want to share it with you. 1. A couple of months ago I saw an adv. in the [United Church] Observer, stating that Camp Woodboia, SK would be celebrating its 60th anniversary at the end of July. In summer 1949 I was on a student field at Mankota, SK. It was the last stop on a railway line running west from Assiniboia. There were two other student fields on the same line. South of us were ranch country, and Montana. West were the Cypress Hills – more ranch country. Some 20 miles north was another East-West line, with larger towns, and ordained ministers. And farther north was the main line joining Regina, Moose Jaw, Swift Current and eventually Calgary. There had been a church camp at Coderre, to the north, but the water level had fallen and the site was no longer suitable. The other two students on our line had been in touch with Victor Wilkinson, minister at Lafleche (I believe he was supervising one of them) and had come up with a plan for holding a camp at Wood Mountain. Wood Mountain was a historic site, where some battle or other had been fought in the 1800s. About 4-5 miles south of the little town there was a river; the spot was isolated, but people gathered there for rodeos and sports days. And the provincial government had recently built a swimming pool. I was co-opted, and we held a weeklong camp, with some 35 youngsters. The next summer I was not involved, as I was ordained in June and didn’t arrive in SK (Readlyn – same presbytery) until July 1. Moreover, my friend Don Collins, who was minister at Rockglen, had organized a small camp at Big Beaver, and had asked me to help him. But Don and I did drop in at Woodboia one day. The following winter, 1951, Assiniboia Presbytery decided to concentrate its camping activity at Wood Mountain, and I was made chair of the Camp Committee. We held two successive sessions, of a week each; the first was for teenagers, and we had about 35 participants, and the second for younger kids, 10-13, and there were about 107 of them. Each camp started on a weekend, and on the Sunday between the two sessions, cars and trucks arrived, bringing the children and taking the teenagers home – except for those teens who had been asked to stay the second week and help out. Staff consisted mainly of student ministers assisted by young women who were teaching school in the rural and small town schools of the area, thus providing opportunities for a bit of romancing and keeping everybody happy. Vic Wilkinson was business manager, and I directed the two camps. On the second Sunday afternoon, the day of the changeover, we held a church service on the bleachers, and it was attended by over 200 people. One of the students was a musician (Grade 10 piano, I believe) and trained a choir; we sang in four-part harmony and a capella. The weather cooperated in 1951; we were totally under canvas, the cooking and eating were done outdoors, and there were only a few light showers. But we worried: what would happen if we got a three-day rain, perhaps with hail? The roads, western gumbo with no gravel, would be impassible. We decided that we needed a building, a dining hall with a kitchen. We rented three acres. But who would erect the building and how would we pay for it? A retired farmer, an immigrant from Sweden, was available; he had put up his own house and barn many years previously. August Dahlman and I spent half our time for about a month (May and June, 1952) living in a tent on the property, and other volunteers came in by the day as we needed them. We put up a building 26’x 72′, with a 12′ kitchen and pantry at one end, and the rest intended for dining and crafts. I figured and ordered the materials. I borrowed an old army truck and hauled rock to put in the concrete foundation. The cost was about $1700, and we asked each pastoral charge to raise at least $100. We received various gifts, including two superannuated stoves for the kitchen. Some equipment, tables, benches, tents, dishes etc. were brought in from Coderre. And we were in business. We planned a format similar to the previous year: first the teenagers for a week, then the children, with the changeover and church service on Sunday afternoon. But it rained every day but one that first week, with hail filling the trenches. We moved the girls into the building, and put the boys in the largest tent. Only one truck came in that Sunday (one boy was sick), others could not get through. A couple of leaders borrowed horses from a nearby rancher and rode to town for supplies. Most of the campers went home on Tuesday, the rest on Thursday. The children’s camp was postponed for a week. We were 114, so enthusiasm was still high. For some reason I have no clear memory of 1953. In 1954 we first had a one week “leadership work camp” for teens, which I directed, then a ten day camp for boys, followed by a ten day camp for girls. I left for Nova Scotia during the second camp. Rev. Victor Wilkinson and his first wife, Marie, at their wedding. 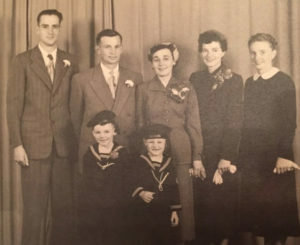 Flemming Holm (left) was best man, and Shirley Nelson (née Sproule, the sister of Marie’s late first husband) is beside Marie, who had two small boys from her first marriage. Photo courtesy Cathy Sproule, Shirley’s niece. Before I departed I prepared a “time capsule” and left it at the church in Assiniboia, so there would be a record of the early days of Woodboia Camp. During the past three weeks I have been in touch with the minister in Lafleche, and have sent her further materials for their sixtieth anniversary celebration July 29-30. In 1991, after I retired, I spent six weeks travelling across the country, visiting friends and family; three days of that time were spent in the Assiniboia area, and I met a number of people who had helped at Woodboia, several of them as cooks. I also visited Vic Wilkinson in Ontario. (While still in Sask. I had stood with him at his wedding.) Somebody found a song I had written and forgotten about. The camp is still functioning, and the building is still in use!! And the song is being sung again! !